Count: Number of sentences you want. If you specify it as “ALL” (without the quotes and all caps), it will grab all of the quotes. Show: The show you want to grab quotes from. 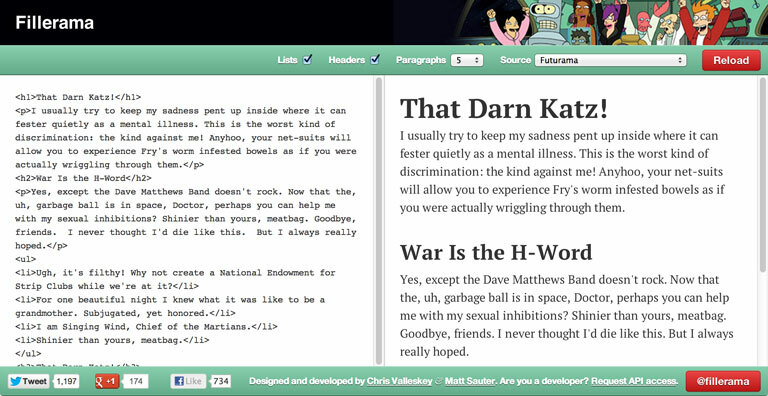 Available options: arresteddevelopment, doctorwho, dexter, futurama, holygrail, simpsons, starwars, and loremipsum. Posted under Projects with tags html, js, utility. There are 8 comments so far. Join in! What a great plugin. I was using something similar that I had hooked into Text Expander that used The Big Lebowski filler text. Any chance we can get some Dude in here? Great idea! I’ll have to find a good source of quotes from the movie but I like the idea of having it in there. Cheers! Many thanks for this… I’ve had a rough time of it finding a ‘random quote’ API that supported JSONP, and it honestly had me thinking there was something wrong with my jQuery.ajax() call. If you want to see the results of my labor, it’s up on codepen here. Your Arrested Development generator kept me smiling through my soul-crushing job. Any chance you’d accept volunteers to add content? Yes! I’m working on a new version that lets users submit content. Stay tuned. What a fun plugin…I cant think of anything better to fill my templates and crack a smile at the same time. This is a fun plugin. I am going to use it in all my projects from now on. You know what? The Hitchhiker’s Guide to the Galaxy would be a nice source of quotes.